Terri Noll has been a volunteer for Visiting Nurse Association of Ohio's Hospice program for almost 10 years. She volunteers for VNA of Ohio's Eleventh Hour Companionship program, rooted in the hospice philosophy that no person should die alone. Companions who volunteer for the program are asked to make themselves available on short notice to share in the last hours of a hospice patient’s life, sitting in vigil and providing a loving, compassionate presence. Since 2009, Noll has completed 51 assignments and only misses for emergencies. She takes her time caring for each patient she encounters and makes them know they are special, getting to know each one and reminisces with them about the past, trading memories. Noll represents the gold standard for hospice volunteers. She trains all new VNA Hospice volunteers and ensures that the new volunteers are comfortable being in their own. Apart from her service with VNA of Ohio, Terri also volunteers at two nursing homes, Lutheran Home at Concord Reserve and Huntington Woods, both in Westlake. 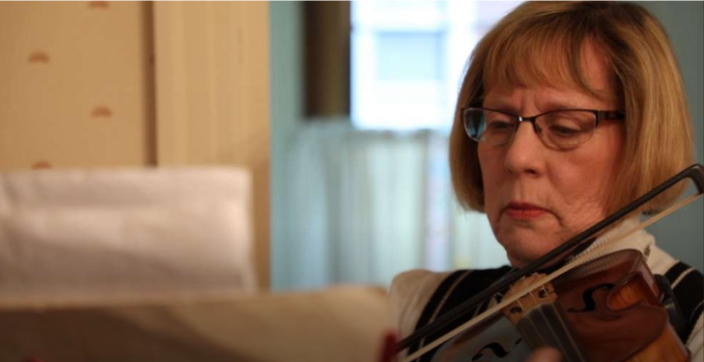 She plays violin for patients and visits with them. She is also on the “Prayer and Care” committee at St. Thomas Lutheran Church in Rocky River where she visits with former church members who now live in nursing homes.